The verses 255 to 257 of 2nd chapter of Quran is famously known as aayat al-kursi or verse of the throne. It contains both esoteric and exoteric vastness of meaning and the Prophetic tradition speak very high of the merit of the verses. 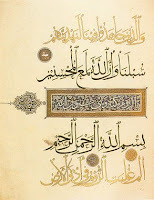 Prophet Muhammad, peace be upon him, is recorded as saying that everything has a zenith, and the zenith of the Quran is Sura al-Baqarah; and as for verses, it is Ayat al-Kursi. A beautiful mystical interpretative version of the verses are given by sufi teacher Lex Hixon in his wonderful book, The Heart of the Koran. Here is the version with slight modification. ... Bismil'Llah. 2:255. There exists only One Supreme Source, One inexhaustible Power calling Itself Allah, the Profoundly Living One, the Life beyond time that never diminishes. The One Reality never unconscious, nor even for a moment rests Its embracing Awareness. To the One alone belongs the emanation of planetary existence and all beings. 2:256. There should never be the slightest compulsion brought to bear upon any being to walk the exalted way of Islam. Allow humanity to be attracted spontaneously to Islam by its utmost clarity, for Islam simply makes clear the truth that there can be only One Source. This Truth alone dissolves the primal error that turns away from the Ultimate Source by mistaking various limited view to be ultimate. Whoever ceases to rely on any idol, on any limited human understanding, and relies solely on the Limitless Source Allah, has grasped the most trustworthy support, the clear and indestructible essence of Islam. Indeed Allah Most Wise hears inwardly the spoken and unspoken prayers, and perceives intimately the open and hidden motivations of all things. 2:257. Allah Most Merciful gives the perfect guidance and full protection of His Divine Friendship to those who affirm the Source of Love with their being. Those who live the life of constant spiritual affirmation, Allah Most High brings forth from the shadow realm of subjective impulses and limited concepts into the clear Light of the Source. But those who turn away from the Source of Light, who for guidance and protection rely on the graven images of limitation, are drawn from the clarity of revelation into the realm of shadows, and will inevitably experience the Majesty of Allah as tremendous fire. note. some school of thought maintain that aayat al-kursi is only verse 2:255, whereas other maintain that it includes 255 to 257. you may listen and download (right click and select Save as...) the original arabic verses here.